Scott and Madeline Madden have been trying to ignore their strange childhood as much as possible, but after their aunt commits suicide by grenade they are drawn back to their childhood home to meet with their estranged cousins. They are unable to resist the temptation to investigate some of the mysteries of their childhood, including their parents' disappearance, and the bizarre legacy their aunt left for them. I really like Tim Powers' books, I think he has some fantastically imaginative stories and a real knack for making bizarre plotlines seem strangely plausible. Unlike most of the Tim Powers books I've read which tend to be historical fantasy this is (mostly) set in the modern day. I think this is maybe a bit of a problem because it makes it more glaring how how odd some of the characters' behaviours and motivations is, admittedly that may be somewhat explained by some of the traumatic events the characters have in their past but I think it's easier to accept the eccentricities that Powers' characters tend to have when they are (for example) 19th Century Romantic Poets rather than young adults in modern-day Los Angeles. Occasional problems with characterisation aside, I did find this an entertaining book to read and Powers does his usual trick of taking surreal and magical events and make them seem like they have their own skewed logic to them. In this case, the key plot decide is the so-called 'spiders', drawings of mysterious eight-legged figures which when viewed give the person who looked at it a vision of the past or future. The viewing into the past element leads to a lot of overlap with Golden-Age Hollywood, and Powers is maybe more comfortable with the scenes set there rather than in contemporary LA. 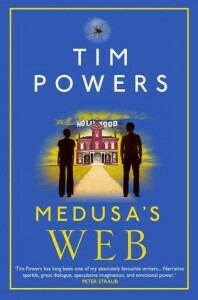 Overall, I wouldn't rank this among Powers' best books, but even an average Tim Powers book is still worth reading.